Israel consulted with Egypt and Abbas before the Cast Lead campaign against Hamas, WikiLeaks revealed. Cairo turned down chance to take over Gaza. Israel consulted with Egypt and Abbas before the Cast Lead campaign against Hamas, WikiLeaks revealed. Documents also show that North Korea armed Iran, Iranian Revolutionary Guards smuggled arms to Hizbullah in ambulances, and Israel warned the United States 17 years ago that Iran would develop a nuclear weapon. Most of the documents simply confirm reports previously published in media by unidentified sources, but the significance of the leaked cables is that they offer hard evidence. It is generally assumed that Egypt and the Palestinian Authority, headed by Mahmoud Abbas, would be happy with any Israeli action that would weaken Hamas, despite their public statements against IDF counterterrorist actions. Hamas took over control of Gaza from Abbas’ Fatah movement three years ago in a bloody militia coup that embarrassed the Palestinian Authority and the United States, which trained Fatah armed forces. During the three-week Operation Cast Lead war against Hamas two years ago, Abbas was uncharacteristically silent, and the WikiLeaks documents explain why. Barak added that the answers were “not surprisingly” in the negative. The crowded and poor Gaza region has been considered an unwanted area even before the Six-Day War in 1967 when it was part of Egypt, which happily refused offers to take it back. The North Korean-Iranian connection also has been known, and North Korean’s link with the Iranian axis was proven three years ago when Israel bombed a Syrian nuclear facility being built with North Korea's help. However, the WikiLeaks documents exposed a diplomatic cable from last February that Iran bought acquired 19 advanced North Korean missiles that were manufactured using Russian-based technology. The Obama government then realized the accuracy of Israel’s warnings that Iran had far more advanced weapons than previously assumed. The terrorist organizations' known use of ambulances and medical supplies to camouflage weapons, in violation of the Geneva Convention, was also proven by WikiLeaks. Red Crescent ambulances smuggled weapons into Lebanon for Hizbullah during the Second Lebanon War four years ago. 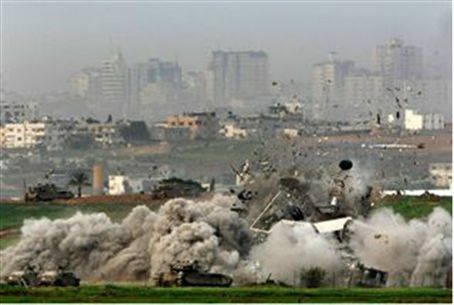 Israel previously has provided evidence that Hamas used the same technique in Gaza and that the Palestinian Authority smuggled suicide terrorists on ambulances during the Oslo War, also known as the Second Intifada, which began in 2000.